So basically dry veg manchurian is the best Indo-Chinese Street food recipe and I have prepared it with super healthy home touch. 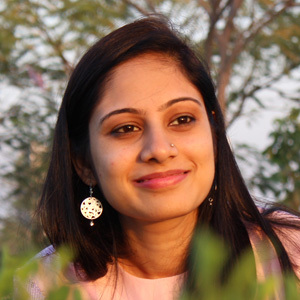 Indo-Chinese Recipes can be defined as “Indian Ingredients and Chinese cooking techniques.” Mostly vegetable Indo-Chinese recipes are made with vegetable substitutes of non-vegetarian ingredients like chicken, pork etc. This is all-time favorite recipe and that’s why, I am sharing it as my first Chinese recipe. You can also find Mexican recipes like Veggie Pizza Quesadilla and Healthy Mexican Veggie Tacos with Spicy Kidney Beans. 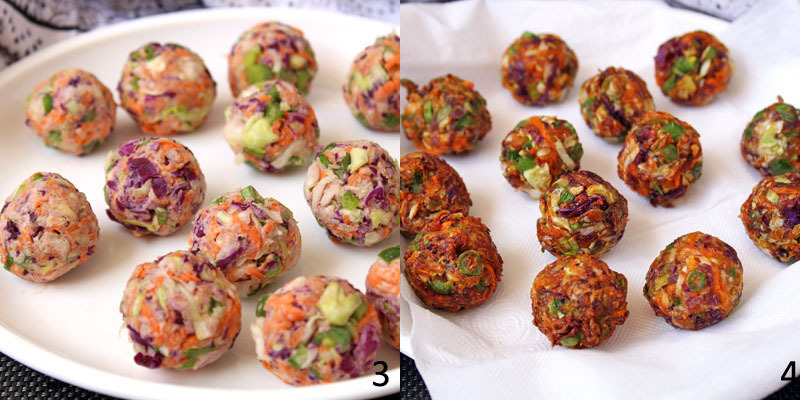 Veg Manchurian Balls – made with lots of vegetables like cabbage and some carrots beans and capsicums. They are full of nutrition and lovely in texture. Veg Manchurian Gravy – made with soya, red chilli sauce, green onions and some basic seasonings. The Sauce is super tempting and has spicy, savoury, tangy, sweet and salt flavor with velvety texture. All you need is cut your vegetables finely or grate them, add some corn flour and all purpose flour to just bind it. And do very basic seasoning with salt and pepper powder. Then make smalls balls from it. You can make almost 15 balls from the amount of vegetable mixture. Then fry them till it turns into dark brown color. Your quick and easy veg maunchurian balls are ready. If you want to throw a party, then you can make them in advanced. And at serving time, add them into gravy. 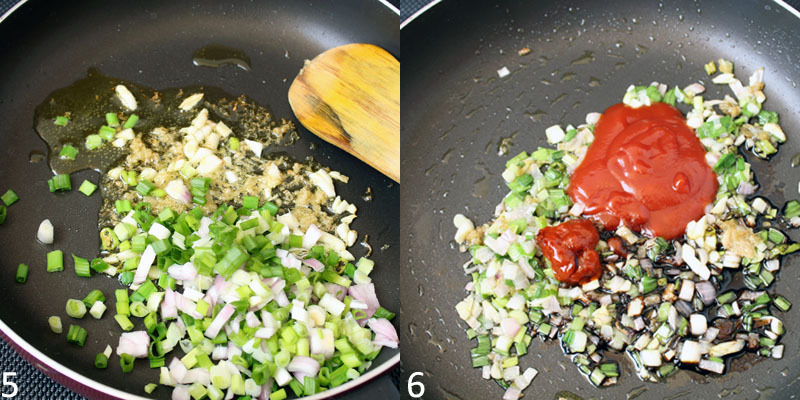 To make gravy, heat some oil into skillet, add garlic, ginger, green onions and Sautee for a while. Then add soya, red chili sauce and tomato ketchup. Then to make some thick consistency, take 1 cup water and add 1 tbsp corn flour, dissolve it into water and add that water into sauce, your sauce is ready. Add manchurian balls into it, and let them simmer for 2-3 minutes. 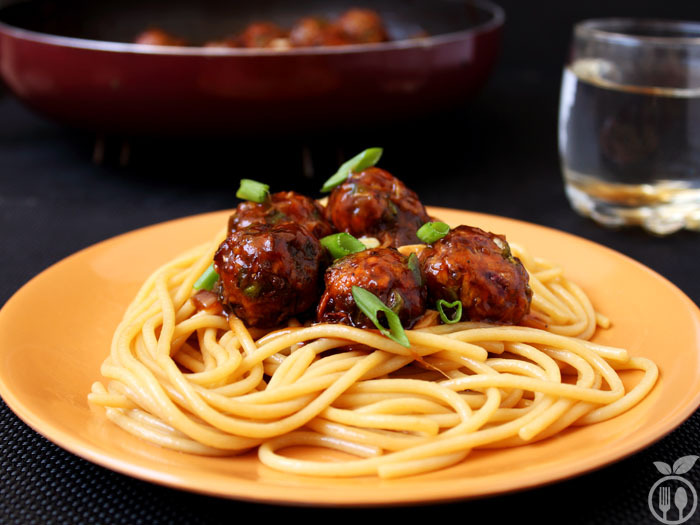 Serve it with some garlic noodles or some fried rice, It will taste amazing… I like little more sauce though it is dry veg manchurian, but you can adjust sauce according to individual preferences. 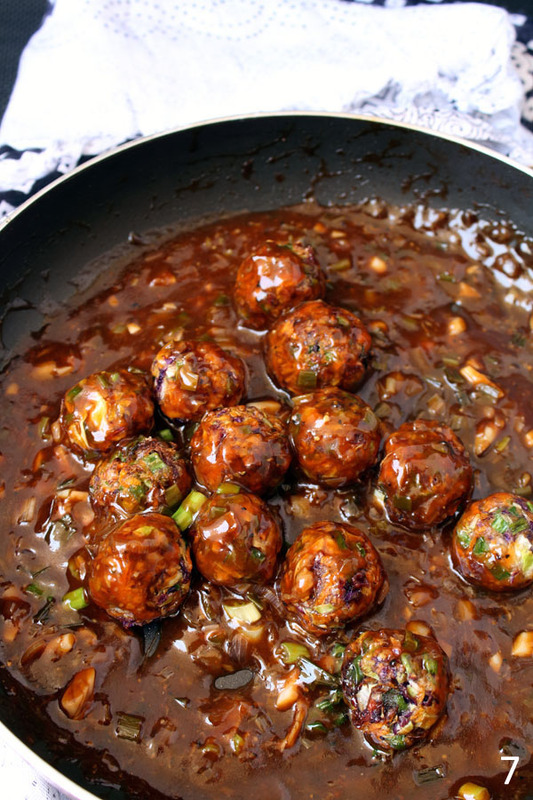 While making veg manchurian balls, add very less amount of flour, otherwise balls become soggy. 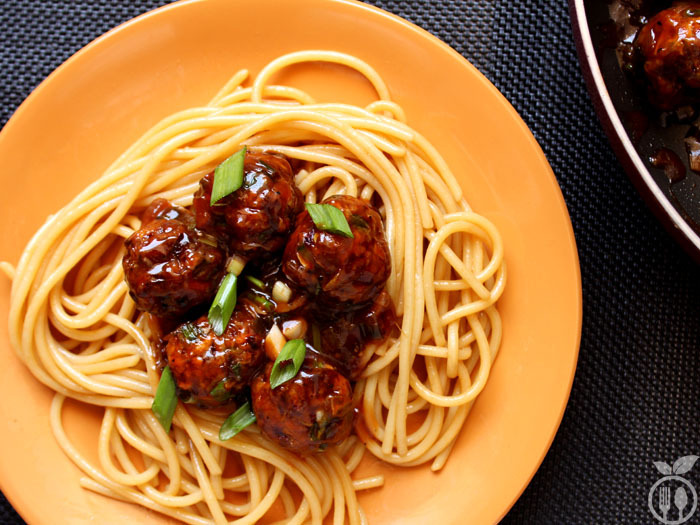 Only cabbage and carrot combination is also goes best for making Manchurian balls. I avoided the red food color and soda to make it healthy. The gravy consistency can be more watery if you like more saucy form. To achieve it, add less corn flour with water. Dry Veg Manchurian Recipe - Small fried veg manchurian balls dipped in thick, hot and spicy gravy made with garlic, ginger, red chilli and soya sauces. Dry veg manchurian recipe is a tempting appetizer dish which we often ordered at dinner in any chinese restaurant. But now on wards no need to go to any chinese restaurant as these step by step photos will help you to make it home. 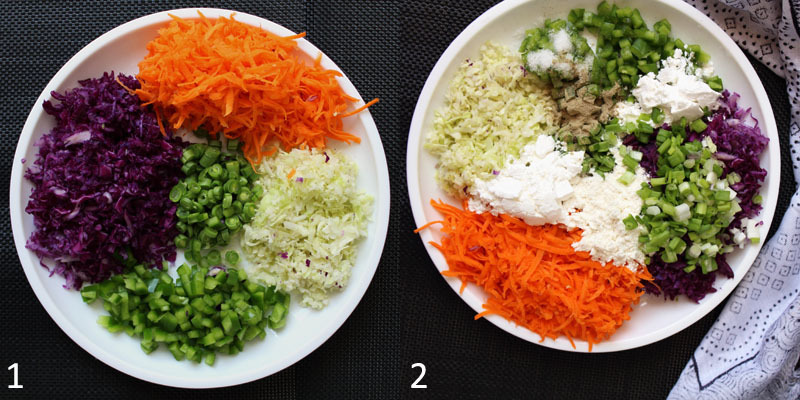 Take all chopped veggies into large bowl, add salt and pepper and mix it well. Now add both flours and mix it well. Heat the oil for frying before making balls. Take small portion of veggie mixture and make roll out of it. Similarly, make all balls. Carefully, place the balls into hot oil, cook it till golden brown crispy color. Cook it at medium heat, in very hot oil the balls become hard form outside and undercooked form inside. Remove balls from oil and keep into some kitchen papers. And let it be cool completely. In a small bowl, take 1 cup water and mix 1 tbsp corn starch and dissolve it into water. Now, turn the gas on high flame, add green onion and just cook for 1 minutes. Add manchurian balls and keep stirring till balls absorb the sauces. 1) Serve it with garlic noodles or fried rice. 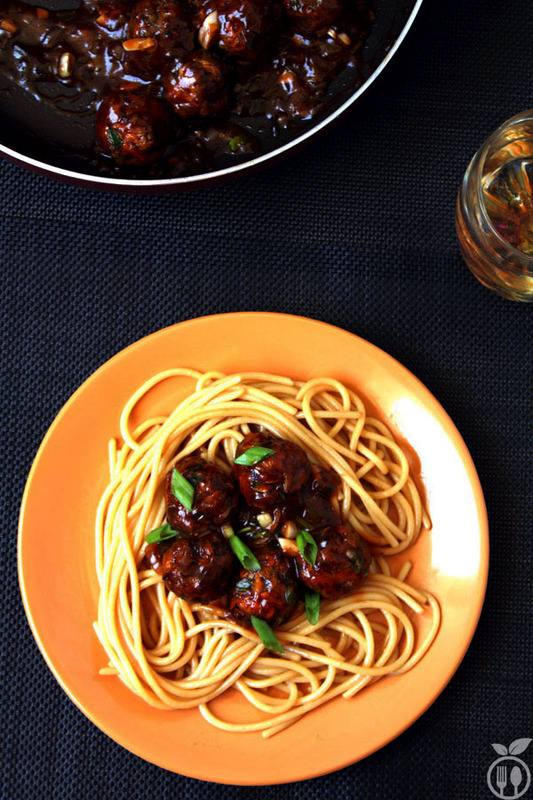 2) Some starters like hot and sour soup or corn soup is best compliment with manchurian dry.